I love surprises. I especially love good surprises. And I really, really like it when that good surprise turns out to be only the first of several. That’s the case for Awakening. I loved the book, and it’s the first of a series. Book two, Uprising, just released in June. I’m getting it. Jake starts his first day of junior high completely oblivious to the fact that he has been chosen for something incredible. That same afternoon, he learns that he has been marked as one with the power to save an entire kingdom. Through the course of his journey, Jake discovers that his advanced musical abilities are peculiarly connected to a mysterious power known as Ragesong. 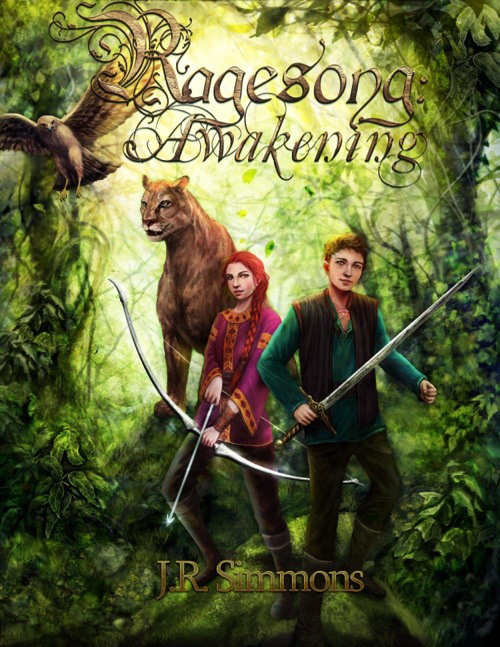 Joined by a shy, young girl with similar musical talents and two Changelings that hold a fierce loyalty to their homeland and king, Jake must learn to harness this ability in order to survive the dangers of a hostile new world. This was a wild ride! I know there are many alternate world fantasy adventures on the market, but this one has an edge. Sometimes I make an allowance for a trace of clunkiness in the prose if the story is compelling, but this one had prose as sharp as a knife edge and a plot to go with it. And the dialogue? Spunky, quirky, light, and exactly right. That touch of lightness is necessary. It balances out a series of events that could be overwhelming to readers under ten. That’s because Jake is called on to battle, not monsters, but an army of men. There is killing involved, and some of it’s done by a junior higher. That is my one and only qualm. On the other hand, this world is ruled by the most evil of villains, and it is kill or be killed. It’s a battle for re-conquest. The violence is not gratuitous, it’s often video game-like, but it’s there. Your review really grabbed me. Really sounds like a unique story that is a tad different and well-written. Will add it to my list. It was a page-turner, Pat, and well written. A great find. I really appreciate your attention to violence in this review, and to “lightness” (vs. clunkiness) of dialogue. Although I’m not a mom of youngsters any more, those two attributes are exactly what I would be looking for in choosing books with my kids. Yeah, that’s the mom in me coming out, too. Sorry I haven’t peeked in on your blog for a while. All non-essential activities have ground to a halt through November. Ach!! You’d love it, Erik. I’ve gotten to know Mr. Simmons. If you have the time and inclination, I’ll email you his contact info. I bet he’d be thrilled to send you a copy in exchange for a review!